Tag Archives: First millennium B.C. 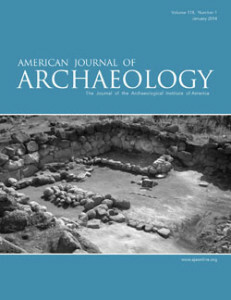 Front cover of the American Journal of Archaeology! The journal of the Archaeological Institute of America used to have a cover dominated by its adorable owl crest and the title, but it appears that they have changed the format to include a photo and more dynamic use of color. And whose work is on the very first photo cover? Yes, that would be mine: http://www.ajaonline.org/nonsubscription The premier American classical archaeology journal chose to feature not Athens, nor Rome, not even Palmyra or Pergamum, but Tsaghkahovit’s Room WSI! The link above will likely change when the new issue is released, so I’m including a (sadly pixellated) image of the cover here, too. A better look at the room can be found here, and to read more about our work at Tsaghkahovit, you can go here to the Project ArAGATS website. This entry was posted in Archaeology and tagged Archaeology, Armenia, First millennium B.C., Tsaghkahovit on January 6, 2014 by Elizabeth. Another day, another period uncovered: Hellenistic remains at Armavir! 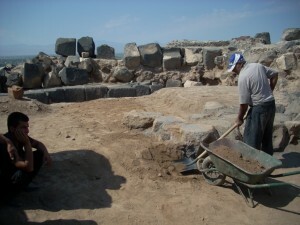 We had been focusing on removing the medieval (and modern) remains at Armavir, in order to expose the Urartian-period temple courtyard, when we started to uncover large flat stones with distinctive wedge-shaped holes. 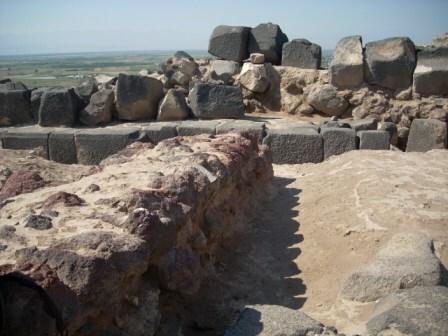 The early first millennium BC architecture at the site (e.g. the Urartian temple) was constructed of well-worked stones laid next to each other, sometimes with joins that jogged slightly, but without mortar or clamps or other fasteners between the blocks. In the Hellenistic period, throughout the Mediterranean world, a type of clamp frequently called “swallow-tail” was used. The name comes from the shape; a wedge-shaped hole was made in each block on either side of a join, and when you look at the two stones next to one another, the holes make a bow-tie or swallow-tail shape. 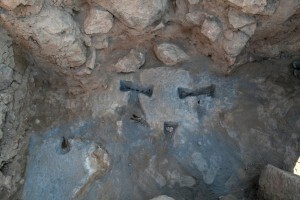 A fastener was then inserted across the two stones, linking them. In many cases in the Mediterranean world, the fastener (clamp) was made of metal. One of the reasons you see ruins now with ‘bites’ out of the ancient blocks is that the metal was valuable, and people would destroy the corners of the stones to dig the metal out. 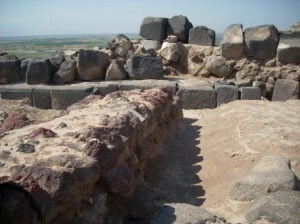 But here in Armenia, it had been speculated that wood was used as the fastener. And now—there is evidence! We found wood in situ in the swallow-tail holes. This discovery is interesting for three reasons: one, that we uncovered a Hellenistic-period layer at the top of the hill; two, that the lead excavator now has evidence for the use of wood in joining blocks; three, the fact that we found these blocks under what we thought was an Urartian-period courtyard forces us to reconsider the periodization of that courtyard (since it would be pretty difficult for a 8th- or 7th-century BC construction to lie on top of a later 3rd- or 2nd-century BC wall foundation). I had to leave the site to work in Yerevan, but I assume that the archaeologists continued to unearth the Hellenistic wall foundation; when I left, they were debating in which direction to go, in order to find its extent. Super exciting! This entry was posted in Archaeology and tagged Archaeology, Architecture, Armavir, First millennium B.C., Hellenistic period on September 18, 2011 by Elizabeth.